We are proud to sponsor the football team local to our Calderdale Business Park in Halifax, which is fast becoming an integral part of the community. “The team name is all about having a fresh start, and rising from the ashes,” Club Chair Karen Scanlon says. Karen’s husband Ade Scanlon volunteers as manager of the team. 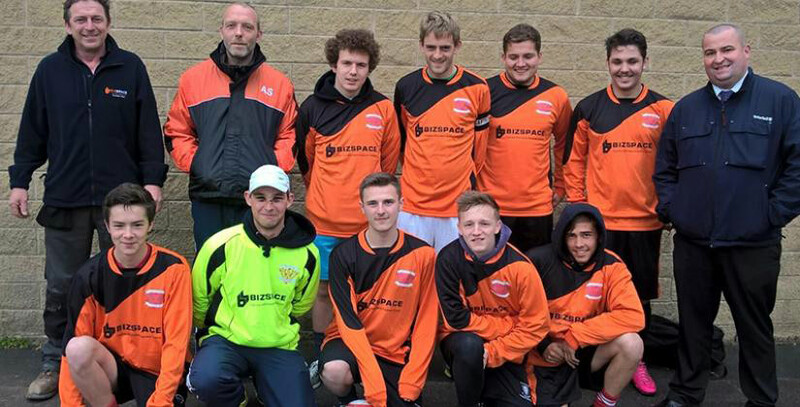 Ovenden Phoenix has the support of West Yorkshire Police and West Yorkshire Fire and Rescue Service, who have helped the team create its own fundraising events, such as car washes and penalty shoot outs. Karen continues: “This will be the team’s second season in the Halifax Sunday League and we are delighted that such a well known firm such as Bizspace has stepped in to sponsor our new away kit and training jackets. Ovenden Phoenix are hoping to improve on their first 2014/2015 season in the Halifax Sunday League, during which they were delighted to win the Sportsmanship of the year Award. They were also winners of the 2015 North Halifax Neighbourhood Awards for Young People. Tom Harrowell, Business Centre Manager at our Calderdale Business Park, first became aware of the team because several of the players attend the North Halifax Construction Skills centre, which is a customer at the site. “I was really impressed with the story behind the team and how it’s genuinely making a positive impact in the Ovenden area,” Tom says. Calderdale Business Park is in a fantastic location for any companies doing business in the Halifax area, and because it is located just out of town, we are able to offer spacious and free of charge on-site car parking facilities. The business centre provides a range of offices, studios and industrial units. For more information contact Tom on 01422 330 433.